Congrats, you’re almost nearing the end of your second trimester. 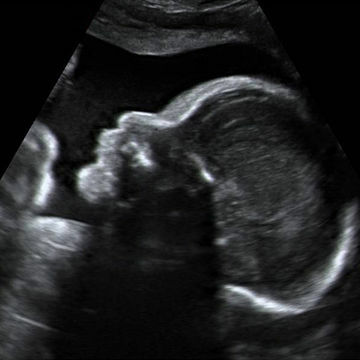 Your baby at this phase is breathing well, showing some brain activity and is approximately the size of an eggplant. You’ve probably got a lot on your mind as well starting with thinking about your upcoming delivery date to finding the best pediatrician for your baby. Expect some new and maybe embarrassing symptoms as you head into the third trimester such as having to pee constantly, but its temporary and part of a healthy pregnancy. First things first—the symptoms you’ve been experiencing in the past few weeks aren’t going to go away anytime soon. But on a brighter note, you’ve hopefully found a great way to cope with them. That said, here are some of the symptoms you may experience in week 27 of pregnancy. these are most common and probably going to happen oftendue to the baby growing at an accelerated rate. To get some relief, consider switching sleeping positions and gently stretch your back. Get some exercise and stretch your legs often and of course drink lots of water to stay hydrated. You may be feeling a bit strained to go to the washroom owing to the pressure your baby is putting on you, which can lead to an uncomfortable pregnancy symptom. If you feel clogged up and you’ve done the other remedies such as drinking lots of water, eating fibrous foods, and taking plenty of walks, speak to your doctor to see if a stool softener or fiber supplement is right for you. This maybe a new word for you, and means that you pee when you sneeze owing to the pressure your baby is putting on your bladder. Unfortunately, there is nothing much you can do about it, but you can make the frequent trips to the bathroom and maybe wear a pantiliner just in you happen to sneeze unexpectedly. This is one of those unpredictable pregnancy symptoms, where you may notice your skin, hair and nails getting thicker or even growing faster than before. If you notice any pregnancy symptoms that are unusual such as watery discharge, abdominal pains, bleeding or repeated contractions, and contact your doctor immediately when you do. 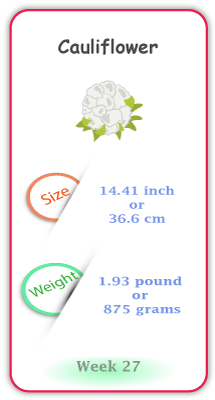 You are probably already used to the weigh you’ve been gaining all through your pregnancy, and a healthy gain when you’re 27 weeks pregnant is around 15 to 30 lbs. If you have gained a little over that number, your doctor will probably recommend keeping tabs on it. This may sound a bit disheartening, but your doctor will be the best position to provide the best tips to keep tabs on your weight. But your twin babies are growing at the same rate as a single baby. Your baby (s) is quite active when you’re 27 weeks, where you may be feeling the kicks and nudges much more often and stronger. 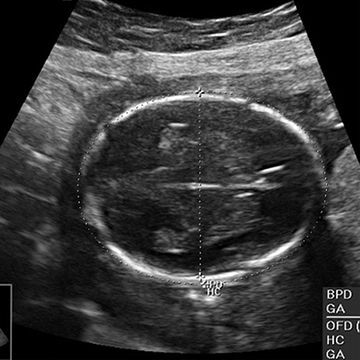 27th Week Pregnant Ultrasound - What to Expect ? But you will most likely have two doctor visits per month starting next week. Your baby when you’re 27 weeks weighs approximately 1.93 lbs and measures 14.41 inches. He/she is sleeping and waking at regular intervals and perhaps even sucking their fingers. Owing to your baby developing brain tissue at a high rate, your baby is much more active now than they were in your previous weeks of pregnancy. 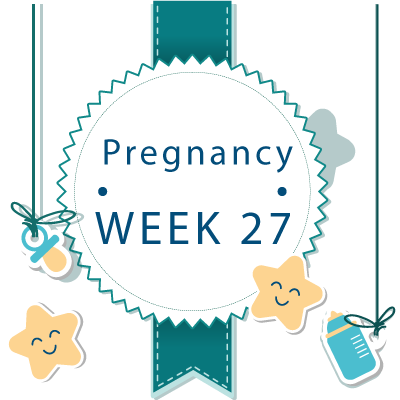 In other major developments in week 27 , your baby will most likely be able to taste whatever you eat such as, if you eat sweet foods, he/she will be able to taste that difference in the amniotic fluid.